Effective January 1, 2017, the U.S. Environmental Protection Agency (EPA) began requiring all U.S. gasoline to meet an annual 10 ppm average sulfur requirement as part of their new Tier 3 vehicle and fuel regulations. The 10 ppm sulfur average applies at the refinery gate, which is the point where finished gasolines or blendstocks for oxygenate blending (BOBs) leave the refinery. Individual batches can still have up to 80 ppm sulfur at the refinery gate and up to 95 ppm downstream of the refinery. Included in the program is a six-year credit averaging, banking, and trading provision that allows refineries that cannot produce qualifying gasoline to buy credits from other refineries in order to comply with the Tier 3 requirement. These credits are generated by refineries who produce Tier 3 gasoline with an annual sulfur average below 10 ppm. A three-year extension until January 1, 2020 of the requirements for qualifying refineries and small business refiners is also included in this program. While the new Tier 3 fuel requirements will remove small amounts of sulfur from vehicle emissions, the primary benefits of the new fuel are to enable new Tier 3 vehicles and their catalysts to lower exhaust emissions of NOx and other ozone forming emissions. A one-year deficit carry-forward provision is included in the program that allows an individual refinery that does not meet the 10 ppm standard in a given year to carry a deficit forward for one year if necessary, as long as they make up the deficit the following year. There are also the typical EPA hardship provisions that allow refiners to petition for compliance assistance based on extreme hardship and/or extreme unforeseen circumstances. EPA estimates that 108 refineries will be effected by the Tier 3 requirements. About 40 of these refineries are already producing gasoline that meet the Tier 3 specifications, and about 20 refineries are eligible for the three-year small refinery/small refiner delay. 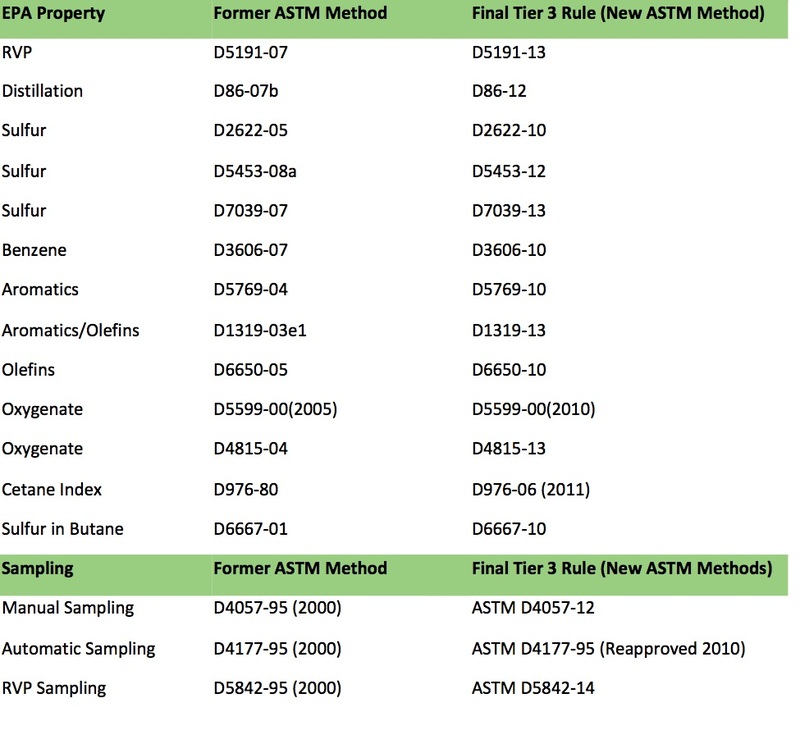 If your refinery laboratory needs assistance in interpreting and implementing the new and revised ASTM methods to meet Tier 3 testing, reporting, and product certification requirements, please contact Stillwater Associates.